Pride of ownership is no more evident than with this home! From the moment you arrive, you can feel that this is HOME! Fantastic, open floor plan with 3-way split affords privacy and easy flow! No wasted space here! Ceramic tile on the diagonal throughout, with exception of the secondary bedrooms. Spacious Living room with high ceiling, ceiling fan and Planation Shutters! 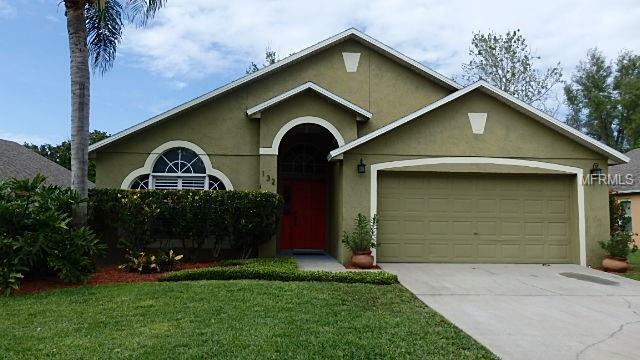 Beautiful, spacious kitchen updated in 2012 with solid wood 42" cabinetry with crown molding, Granite counter tops, island, breakfast bar, and Stainless Steel appliances! Some cabinets have stainless pull-out shelving & hidden garbage receptacle! Kitchen opens to Dining/Family room combination! High ceilings give the area an open, light & bright feel! Many architectural features include plants shelves, niches and arches. Spacious Master suite w/walk-in closet, lrg mstr bath with jetted tub, dual sinks, shower! Secondary bedrooms are spacious! Upgrades are plenty and include large screen porch accessible off Family room in back(2014-2015), HVAC (2014), Roof (2016), Solar hot water heater(2016) upgraded faucets in bathrooms, upgraded tile in master bath(2018)! In 2019, kitchen sink faucet, Disposal, garage door opener and updated landscaping and irrigation system! On top of this, the location is perfect! Easily accessible to shopping, restaurants, hospital, 417, I-4 (and in near future, the completed 429 Expressway). 2 Sunrail Stations (Sanford & Lake Mary) are both less than 10 minutes away! Make this awesome property your next home!